After a year of unprecedented tensions, North Korea unexpectedly decided to attend the Pyeongchang Winter Olympics in South Korea. So why is the North participating and what could go right or wrong during the Games? Is North Korea's attendance a big deal? Yes. While it is not unusual for North Korea to take part in international sporting events, this one is different because of context and timing. The Korean peninsula has been divided since the 1950-53 war. The two sides have never signed a peace treaty and the last Olympics in South Korea, in 1988, were boycotted by the North. Throughout 2017, the North conducted numerous missile tests, including rockets they said could reach the US mainland. This came amid an unprecedented war of words between US President Donald Trump and North Korea's Kim Jong-un. But Pyongyang's decision to attend meant talks took place between North and South for the first time in years. It is even sending its nominal head of state to the South for the first time ever. But is it a diplomatic breakthrough? Kim Jong-un caught everyone by surprise when he raised the prospect of Olympic attendance in his new year speech. This was followed by an invitation from the South, fast-paced meetings and within weeks it was agreed the North would send athletes as well as a cultural troupe. But this was not the result of a long diplomatic effort and does not put an end to underlying tensions. Although the South did postpone one of its routine military drills with the US, which always enrages the North, nothing has been resolved on the nuclear front. "Any future interactions over other strategic issues, whether it's weapons of mass destruction or family reunions, will probably prove to be more difficult," North Korea analyst Michael Madden cautions. Might the North disrupt the Games? Ahead of the 1988 Seoul Olympics, agents from the North blew up a South Korean passenger plane. Before the latest developments many might have predicted the North could disrupt events with a missile test. But its participation is almost seen as an insurance policy against belligerent action - for the moment at least. A missile launch during the Games would be "totally counterproductive," Oliver Hotham of North Korea watchers NK News warns, but we should "expect tests in Spring once it's all wrapped up". Is the North new to the Olympics? No. North Korea is a regular participant at international sports events despite its pariah status. They're not even doing that badly. North Korea has won 56 Olympic medals, 16 of them gold- but only two came from the Winter Games. Although the North boycotted the 1988 Olympics in Seoul, they have attended other competitions in the South. In the 2002 Asian Games in Busan they won nine gold medals and secured 33 spots on the podium. 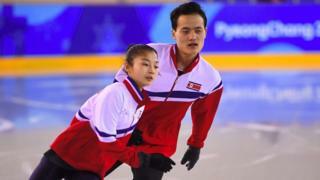 Reality Check: How good is North Korea at sport? Will Team NK bring home any medals this time? There will be 22 athletes from the North, but none are thought to be medal prospects. The only ones who actually qualified on sporting merit are a duo of figure skaters. "Right now, to be realistic, the goal is to make it into the top 12," their Canadian coach Bruno Marcotte told the BBC. The attendance of other players were agreed in a meeting between the North, South and the International Olympic Committee.. They are not expected to perform superlatively. Will the two Koreas compete as one? Yes and no. The teams will march at the opening ceremony as one country, under a single "unified Korea" flag. The flag shows the entire Korean peninsula in blue on a white background and has made an appearance at previous sporting events. In the run-up to the Olympics, some South Korean skiers participated in a joint training programme at a ski resort in the North. Twelve female ice hockey players from North Korea will also participate as part of a joint team with the South, but all other athletes will compete for their respective countries, including two North Korean skiers who will take part in the Paralympics in March. Are athletes the only North Koreans going? No. Alongside 22 athletes, the country is sending an 400-strong delegation to the games. Among those will be a will be a team of cheerleaders, 30 taekwondo practitioners and a 140-member orchestra, the nationalist Samjiyon Band, dishing out patriotic songs. They will be led by the highest-ranking official to ever travel South, the North's ceremonial head of state Kim Yong-nam. So is this a propaganda win? In the eyes of Pyongyang - yes, both domestically and globally. "The portrayal of Kim Jong-un as a gracious peacemaker will play well domestically," says Mr Hotham and fits the North's image of itself as a peace-loving nation, the victim of relentless international aggression. There is a global dimension too: "The message is that this nuclear power is cultured and is thriving despite sanctions," he adds. For Seoul, it is a chance to signal goodwill and build confidence between the governments as well as public confidence. But it is recognised as a propaganda offensive and few believe it will alter relations on core issues. Will athletes escape Pyongyang's tight grip of control? Perhaps a little bit. North Korea is notorious for shielding its citizens from contact with the outside world and athletes will also be under tight surveillance. But international athletes are more exposed. The two figure skaters spent six weeks training in Canada and are regular guests at international competitions. Can North Koreans watch the Games? Sporting events like the Olympics are shown on television, but they might not be broadcast live and there will be censorship. Things get complicated when competitions involve Pyongyang's "enemies": the US, Japan or South Korea. At the 2014 Asian Games the North faced the South in the football final. With a goal in extra time, the South was the side to take the trophy: the match was not shown in the North and the result never officially mentioned. Yes. You will come across both Pyeongchang and PyeongChang - the latter version is what you'll see on the official logos for instance. The organisers chose to capitalise the C to avoid confusion with Pyongyang, the capital of the North.